Rosin extraction is making waves among cannabis lovers. Rosin represents a new era of purity and refined smokable products. Rosin is also gaining popularity due to the increased interest in concentrates over the last decade, particularly solventless methods. And because it's so easy to make, more and more people are looking to make their own at home. This demand has helped push for new innovative rosin presses. Today, we will look at the best rosin press, how to make rosin and a brief history of how rosin came to be. What is the History of Rosin? What Types of Rosin Presses Are There? What Can You Put into a Rosin Press? What Types of Extraction Can you Expect? 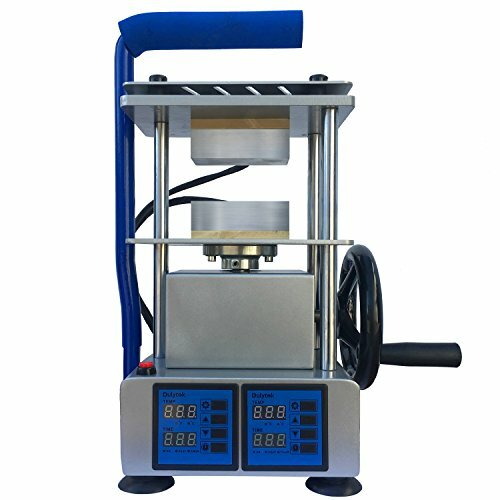 What is the Best Rosin Press 2019? The easiest way to understand rosin is to understand what it's not. Other concentrates use solvents to extract the cannabinoids. Butane extraction, often called butane honey oil (BHO), was one of the first concentrates created. Today, producers use a variety of solvents to create potent oils, shatters, and waxes. Common solvents include ethanol, CO2, and many producers still use butane. Rosin extractions are a novel method of production because they don’t rely on any solvents. Instead of butane, CO2 or ethanol, rosin needs only heat and high pressure to produce similarly potent results. When rosin was first discovered, it wasn’t necessarily a fancy new invention from a high tech operation. Instead, it was an accidental discovery. According to stoner lore, Phil “Soilgrown” Salazar—who was responsible for the rosin extractions we know and love today—started only with a hair straightener. Placing raw flower, or perhaps a bit of hash, between the hot blades of a flat iron, he extracted out the first little drops of clear, pure rosin. After a few years of innovation, and experimentation, he took rosin extractions from a neat at-home trick to commercial production with the invention of the commercial scale rosin press. Today there's quite a bit of variety in rosin presses. You can still use your hair straightener at home, of course, but there are now rosin presses specific for at-home and commercial levels of operation. Either way, a rosin press is basically two large flat plates, which heat up. When pressed together, by hand, automatic controls or mechanical methods, they slowly place higher levels of pressure on the product on the plates. As the raw flower or hash heats up under higher and higher levels of pressure, the microscopic oily cannabinoids and terpenes start to boil. Eventually, under the immense pressure, they explode through, and on to the paper. No two rosin presses are alike. Whether you want to pump out dabs with a flat iron in your basement or want to invest in the highest level of rosin press technology, there is a press out there for you. Initially, after people have moved on from the hair straightener technique, the next logical step was to adopt a tool from another industry. So, many people started using T-Shirt presses for their rosin production. But T-shirt presses were designed for inks, not for the sensitive terpenes of cannabis. Rosin extractions are continually improving, thanks to improvements in technology. Now there are rosin specific presses, large and small, with full control over temperature and pressure settings. The very first press of rosin extract was supposedly from a bit of non-melt hash. But today, rosin enthusiasts have pushed the boundaries in terms of the initial material. Just keep in mind, the higher the quality of input material, the higher the quality of the output. For example, the easiest and least processed type of rosin uses well-cured delicious nugs of flower. You can also use various types of hash including bubble hash, ice wax or kief. Whatever initial product you decide to press will determine what comes out. Perfecting rosin extraction is a fine art. Depending on the type of cannabis or hash you initially use, as well as the temperature and pressure settings you decide on, you can see dramatically different results. Sometimes, you may see a cloudy, budder-type rosin squish out of the machine. Other times, you can expect a clear, shatter-like consistency ooze through the parchment. Rosin presses which incorporate a high level of control over the process allow for adjustments depending on product and preference. The consistency, purity, color and flavor will shift as you play with the controls. You may find differences between products, and even between strains. Part of the fun with rosin is the need to experiment and explore. Why are people choosing rosin over other types of concentrates? Because rosin is the only genuinely solventless extraction process, it removes any issue of contamination. A recent study on cannabis concentrates from the medical marijuana market in California uncovered that nearly 80 percent of samples tested positive for contaminants. Whether that was pesticides lingering from the growing process, or petrochemicals leftover from the extraction process, do you want to inhale these chemicals? With a rosin press, if you put pure cannabis into it, you’ll get pure cannabis concentrate out of it. There's no chance of contamination from solvents or any other chemicals from extraction. We’ve all heard the horror stories about butane honey oil explosions from backyard production. Part of the allure of rosin is that anyone can do it at home. It’s safe, doesn’t use any flammable products, and as mentioned, can be done with a tool as simple as a flat iron. Unlike processes which use explosive solvents, the worst that can happen with a rosin press is a minor burn. Rosin is not only significantly safer than solvent-based extracts for home production, but rosin is also much faster. If you're making rosin yourself, you’ll have a dab faster than you can make a bag of microwave popcorn. Everyone is talking about rosin, so why not jump on the bandwagon and try your hand at making some at home? All you’ll need is a bit of dank weed, a piece of parchment paper, a hair straightener, and a metal collection tool. Dig around in your sister's closet, find her old hair straightener and get started! Note: These same instructions work with the high-level rosin presses reviewed below. While making rosin from a flat iron is perfectly fine for your first attempts into at-home production, you’ll eventually want to move up to a professional press. Not only will you get more output from your input, but you’ll also have much more control over the final product. Not all rosin is created equal, something you’ll quickly uncover as you move from a flat iron to a commercial, professional press. As you play with the temperature and pressure controls of more commercial devices, you’ll notice improvements to quality, color, and quantity. Plus, moving to a professional press isn’t as expensive as you might think. Each press will vary, but the step-by-step process will typically remain the same. No matter what press you end up investing in, always read through the instructions beforehand, to ensure you grasp the controls for that machine. You’ll want to start with small quantities of cannabis as you learn the ropes, to avoid waste. You'll also want to master one type of product (bubble hash, flower, etc) before attempting another. Before starting, do a bit of research on your rosin machine and watch a few videos to understand how to get the most rosin out of your press. The good news is that each pressing takes no time at all, so it doesn't take long the master the steps and perfect the process. Depending on what type of product you plan on extracting, there will be a slightly different preparation process. First, check your manual to determine exactly how much product you can put in at once. Smaller machines may take as little as a gram or two of fresh flower at a time, while commercial presses can take over an ounce at a time. No matter the quantity, you’ll need to place the product inside a micron filter bag, and between a folded sheet of parchment paper. The micro bag avoids messy blowouts during pressing, and the parchment paper collects the hot rosin as it squishes out. Keeping in mind, you'll always need to experiment a bit with settings, there are a few suggested settings to get you started. For straight flower, experts usually suggest a temperature range of 215° F to 235° F, and for kief, you’ll want to lower it to between 150° F to 170° F.
Next, you'll set the pressure per square inch or psi. Flower will need a higher setting, between 600 to 1000 psi, and hash will need less, ranging from 300 to 800 psi. Finally, if you have an automatic press, you’ll set the timer for between 25 to 40 seconds for flower, and between 60 to 75 seconds for kief or hash. If you're using a manual press, you’ll want to set a separate timer to ensure you stay on schedule and don't damage the rosin. Whether your extraction starts from the press of a button, or by a manual crank, it’s time to get started. Most machines are moving towards automatic pressing, whereby all controls are input into a computer before you begin, and the press works without any manual movements. There are still some controls whereby you need to crank or pull levers to start the process. The psi and temperature may be pre-set beforehand, but you control the time. In these more manual setups, you’ll want to follow the manual carefully. Some machines suggest starting slow and steady, with relatively low pressure, before cranking it up for the final few moments. As the press releases, you’ll want to carefully pull out the parchment paper package and remove the bag of compressed weed or hash. This product can be disposed of, as all the valuable compounds were expressed during the pressing. Peel back the parchment to expose all the yummy warm rosin. This is a good time to note the settings you used and the results. Typically you’ll want the rosin to cool almost entirely before starting the collection. Rosin is easier to manage when hardened. Even when hard, it is quite sticky so it should easily stick to itself and release from the paper. Scrape the paper with the metal dabber to collect all rosin. Analyze the consistency (budder, shatter, wax), the color (dark, yellow, green), as well as the clarity (opaque, cloudy, clear), and flavor (compared to raw flower). If you want to preserve and improve flavor, you’ll want to slowly decrease temperature to protect terpene profile. To lighten the final color, you can try reducing the temperature. Dark product may mean its slightly burnt. Also, the age and humidity content of your cannabis can affect the clarity and consistency of your rosin. Producers often start with small trial pressings of new products to perfect the controls before increasing quantities for full production. Rosin presses in 2019 have come a long way in only a short time. If you’ve decided it’s time to retire the hair straightener back to only bathroom duties, check out the many upgrades and professional options on the market today. There is a range of prices and styles available, no matter what you are looking for. Explore the many online resources on rosin production to get a better understanding of what each option offers, and check out the suggestions below. For those just getting started, Tarik Rosin Press is an affordable, yet still an extremely portable upgrade. It’s the next step up from the little dabs produced from your sisters flat iron. It is roughly the size of a dinner plate and looks similar to an old-school Discman or small panini press. The plates are uniquely round and tucked in the center of the device. It makes for a perfect upgrade from a do-it-yourself rosin press to a professional one, because of its low price point, but also because of its simplicity. Before you get confused with the temperature, psi, and time settings of more advanced machines, why not start by simply perfecting the temperature alone? The Tarik lets you play with the temperature between 212 F and 302 F.
With only three buttons, on/off and two for temperature control, the entire pressing process is simple to master. Another benefit of moving from a flat iron to the Tarik also has a lot to do with its ergonomic design. Any at-home rosin presser will tell you, it’s often annoying to get a good consistent press out of a hair straightener, and the plates are usually quite small. 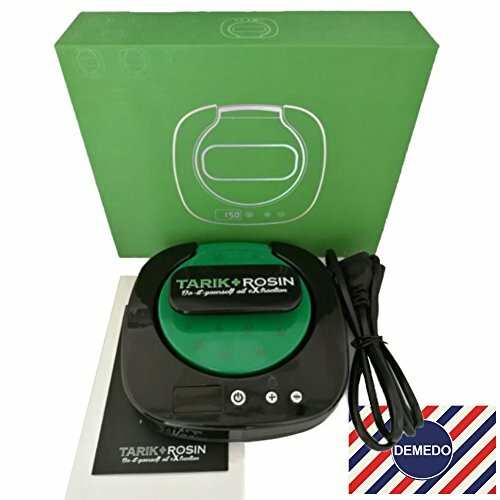 But the Tarik Rosin Press has two large circular plates, nestled into a bowl. This makes it much easier to press, and to avoid any messy blowouts down the sides. Moving on to a more advanced rosin presses, say hello to the NugSmasher. It's a much-loved press, and not just for its adorable name. The NugSmasher gives you control over temperature, and while it's still a manual pressing, the NugSmasher also provides more control over psi. Through innovative design, the manual press can reach up to 2 tons of psi - all while pressed by hand. But rest assured, unlike commercial presses, it's almost impossible to overpress your flower with the Mini NugSmasher. Compared to commercial sized machines, it has a smaller plate at only 2.5 inches, but this is more than enough for your at-home needs. Pressing up to 3.5 grams of raw flower into a high-quality extraction will still impress your friends, even if they are weed connoisseurs. Some of the additional features which make the NugSmasher the best rosin press for at-home use is its portable size. You won’t need to clear off the kitchen table by any means, as it sets up into a compact, travel-friendly unit. It also comes with a lifetime warranty! 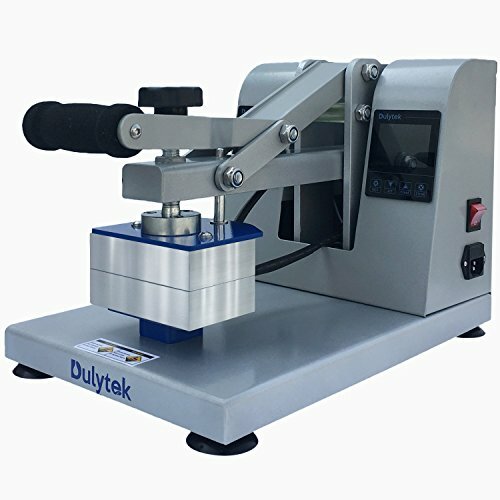 Built sturdy, and for continuous use, the Dulytek is a hand-cranked but otherwise automatic professional rosin extractor. It allows the user to set temperature and pressure settings but uses a simple handwheel to lower the plates together. While many might not want to rely on a manual hand crank to apply pressure, it's beneficial to control when and how fast the pressure comes on. This helps release higher quantities of rosin, and protect some of the valuable compounds. 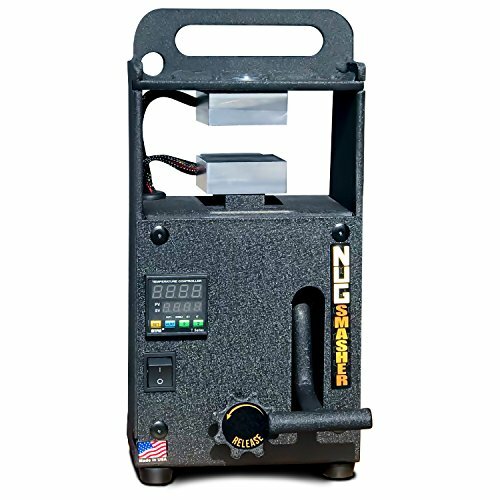 It packs a powerful pressured punch, with nearly 4500 psi if needed. And no, the user isn’t responsible for nearly two tons of pressing capacity, this is done through technical and mechanical design features, not sheer human strength. It also has a huge temperature range, getting up past 700 F, although for most pressings you won’t need to hit nearly these temperatures. The Dulytek DW4000 Handwheel comes with a relatively large plate, measuring 4” by 2”, meaning you can increase your yields and increase returns without added pressings. If you are looking to make a solid investment in your production capacity, the Dulytek DW4000 is worth consideration. If you need to up your production capacity and perfect the process from start to finish, you'll want to invest the Dulytek DM1005. While it is one of the more expensive options on the list, it isn’t without reason. It gives you total control over all aspects of rosin extraction, allowing you the flexibility to delivery consistently dank rosin. Regarding psi, the press allows for up to 1000 psi. It has a built-in timer capable pressings from anywhere from 0 to 999 seconds. It also has an incredible range in temperature, going all the way up to 750 F.
With such a wide range of settings, you’ll find it easy to adapt between raw flower and kief, as well as between strains and your personal cannabinoid preferences. For commercial operations, it also importantly has a large pressing plate, 3” by 5”. Even despite its relatively large plates, it is still relatively lightweight, weighing only 30 lbs. If starting up your own rosin extraction business is what you are after, starting with the Dulytek is an excellent first step. Sometimes you end up paying more for specialized products. This is definitely the case with rosin presses. This argument is why many users question why they need pay more for a rosin press when it's just a glorified T-shirt press? 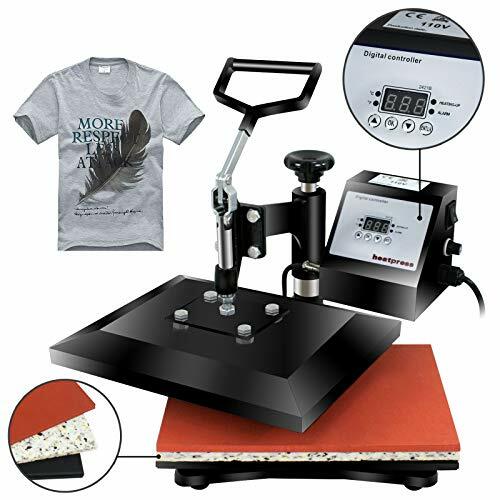 The Super Deal Heat Press, actually designed for pressing clothing, will work perfectly for your rosin - and it's affordable! On top of its price point, this heat press has a 12” by 10” capacity! To improve consistency between pressings, and also uniformity of pressure across a single pressing, this heat press comes with a helpful locking handle. It is a bit heftier than other more portable options, weighing in at 26 lbs, but this added weight does have benefits for the potential psi. Temperature settings go up to 360 F, more than enough for extractions from any product. Set the temperature, and control the pressure, and you have yourself a reliable rosin press. As an added benefit, for those who live in an area with strict rules on cannabis, nobody will suspect your rosin pressing ways if you only have a T-Shirt press. So, there you have it! 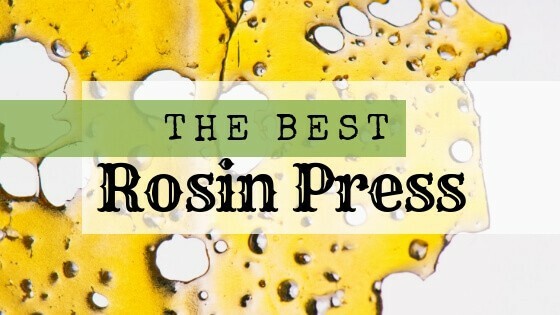 A complete rundown of the best rosin press and how to make quality rosin at home. You don't have to invest in a big press, you can instead opt for a smaller and cheaper hair straightener. When pressing flower, you want the temperature to be 215° F to 235° F with a PSI of 600 - 1000. The quality of your rosin will depend on the quality of materials used. And, finally, you want to experiment with different pressure and temperature settings to find that perfect rosin. Have you used a professional grade press before? Do you prefer these solventless concentrates over something like BHO? Let's talk about it in the comments below!